Discover the stories of others who have been empowered by their Vitagene results to lead healthier and happier lives. "I started using my personalized vitamins around April 2016. Right off the bat, I loved the convenience of getting my monthly supply delivered right to my doorstep. I used to have to visit several different websites and or stores to get everything I needed. At the time I was still trying to take off the last ten pounds of baby weight that I had gained with my first pregnancy. By the end of June, right in time for our trip to Hawaii, I was even a few pounds below my pre pregnancy weight! From my results, I had learned how well my body would respond to exercise, so armed with this information, and the right supplements, losing the weight was easy! And....by the time we got back from Hawaii, I was pregnant again! As an older mom, I am 40, it has been amazing to have such an easy and healthy pregnancy so far. We just found out that we are having another boy, and the genetic screening shows that all is perfectly in order. Thanks Vitagene for making this part of my life easier and worry free!" "Being obese my entire life, I never really cared about my body. After making serious health changes, and losing over 115 pounds, I really started to wonder what MY body specifically needed. 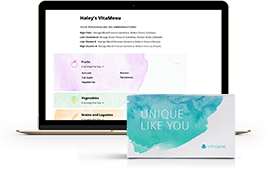 Vitagene gave me this incredible insight into what my body needs, from the inside out. My DNA results really boosted my excitement and focus on self love. I now know how to nourish and take care of my body which helped me figure out a new lifestyle, not just another diet." Post your Vitagene story to Instagram or Twitter with the hashtag #vitagene.